At the sacrifice to the ancestors, the woman had to present harvest offerings in a basket, while the man slaughtered the sacrificial animal with his own hand. Here the ritual is only superficially fulfilled; the woman takes an empty basket and the man stabs a sheep slaughtered beforehand-solely to preserve the forms. This impious, irreverent attitude bodes no good for a marriage. The sovereign Yi gave his daughter in marriage. As those of the serving maid. 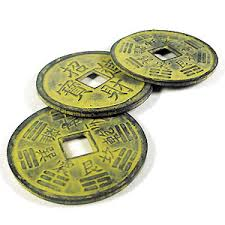 The sovereign Yi is Tang the Completer. This ruler decreed that the imperial princesses should be subordinated to their husbands in the same manner as other women (cf. hexagram 11, six in the fifth place). The emperor does not wait for a suitor to woo his daughter but gives her in marriage when he sees fit. Therefore it is in accord with custom for the girl's family to take the initiative here. We see here a girl of aristocratic birth who marries a man of modest circumstances and understands how to adapt herself with grace to the new situation. She is free of all vanity of outer adornment, and forgetting her rank in her marriage, takes a place below that of her husband, just as the moon, before it is quite full, does not directly face the sun. The marrying maiden draws out the allotted time. A late marriage comes in due course. The girl is virtuous. She does not wish to throw herself away, and allows the customary time for marriage to slip by. However, there is no harm in this; she is rewarded for her purity and, even though belatedly, finds the husband intended for her. The marrying maiden as a slave. She marries as a concubine. A girl who is in a lowly position and finds no husband may, in some circumstances, still win shelter as a concubine. This pictures the situation of a person who longs too much for joys that cannot be obtained in the usual way. He enters upon a situation not altogether compatible with self-esteem. Neither judgment nor warning is added to this line; it merely lays bare the actual situation, so that everyone may draw a lesson from it. A one-eyed man who is able to see. The perseverance of a solitary man furthers. Here the situation is that of a girl married to a man who has disappointed her. Man and wife ought to work together like a pair of eyes. Here the girl is left behind in loneliness; the man of her choice either has become unfaithful or has died. But she does not lost the inner light of loyalty. Thought the other eye is gone, she maintains her loyalty even in loneliness. The marrying maiden as a concubine. A lame man who is able to tread. The princess of ancient China maintained a fixed order of rank among the court ladies, who were subordinated to the queen as are younger sisters to the eldest. Frequently they came from the family of the queen, who herself led them to her husband. The meaning is that a girl entering a family with the consent of the wife will not rank outwardly as the equal of the latter but will withdraw modestly into the background. However, if she understands how to fit herself into the pattern of things, her position will be entirely satisfactory, and she will feel sheltered in the love of the husband to whom she bears children. The same meaning is brought out in the relationships between officials. A man may enjoy the personal friendship of a prince and be taken into his confidence. Outwardly this man must keep tactfully in the background behind the official ministers of state, but, although he is hampered by this status, as if he were lame, he can nevertheless accomplish something through the kindliness of his nature. Above we have Zhen, the eldest son, and below, Dui, the youngest daughter. The man leads and the girl follows him in gladness. The picture is that of the entrance of the girl into her husband's house. In all, there are four hexagrams depicting the relationship between husband and wife. Xian, Influence (hexagram 31), describes the attraction that a young couple have for each other; Heng, Duration (hexagram 32), portrays the permanent relationships of marriage; Jian, Development (hexagram 53), reflects the protracted, ceremonious procedures attending the Marrying Maiden, shows a young girl under the guidance of an older man who marries her. Through progress one is sure to reach the place where one belongs. Hence there follows the hexagram of the Marrying Maiden. The Marrying Maiden shows the end of maidenhood. 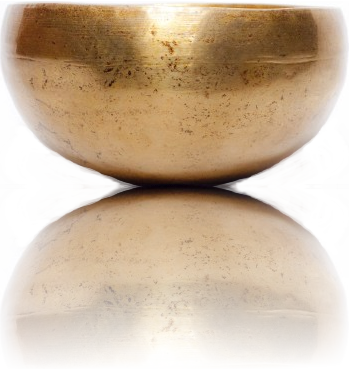 This hexagram is judged in very different ways. In later times it was considered immoral for a girl to marry on her own initiative. The mores demanded that the girl wait for the man to take the lead, as set forth in the preceding hexagram. This goes back to patriarchal times. But the present hexagram has also so to speak a cosmic meaning. For, according to the arrangement of the eight trigrams by King Wen [Inner-World Arrangements], the upper trigram Zhen belongs in the east and denotes spring, the beginning of life; the lower trigram Dui belongs in the west and denotes autumn, the end of life, and the two nuclear trigrams Kan and Li represent the north (winter) and the south (summer) respectively. Consequently the whole cycle of life is contained in this hexagram. A girl who is taken into the family, but not as the chief wife, must behave with special caution and reserve. She must not take it upon herself to supplant the mistress of the house, for that would mean disorder and lead to untenable relationships. The same is true of all voluntary relationships between human beings. While legally regulated relationships based on personal inclination depend in the long run entirely on tactful reserve. Affection as the essential principle of relatedness is of the greatest importance in all relationships in the world. For the union of heaven and earth is the origin of the whole of nature. Among human beings likewise, spontaneous affection is the all-inclusive principle of union. The Marrying Maiden describes the great meaning of heaven and earth. If heaven and earth do not unite, all creatures fail to prosper. The Marrying Maiden means the end and beginning of humanity. Joyousness in movement: she who marries is the young girl. “Undertakings bring misfortune.” The places are not the appropriate ones. “Nothing that would further.” The yielding rests upon the hard. 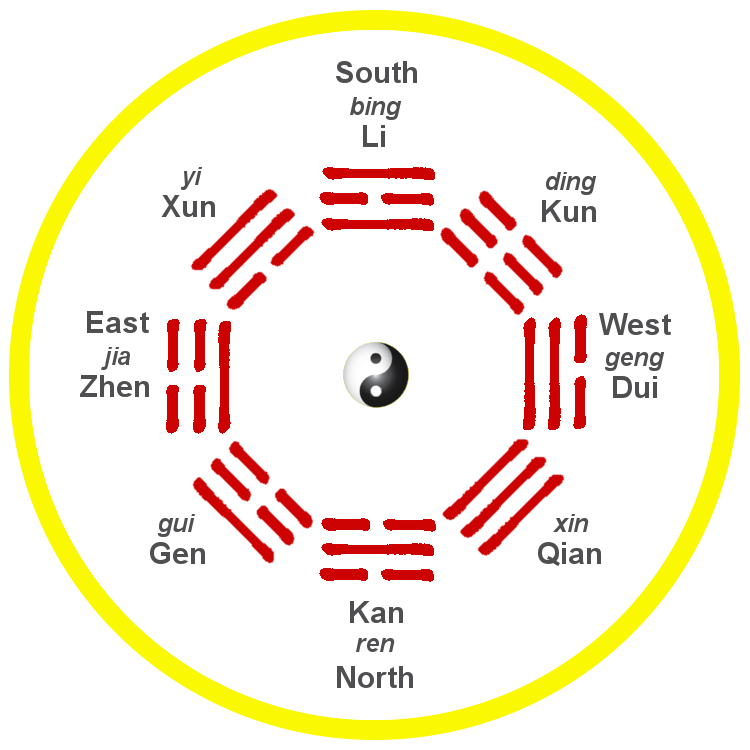 In the sequence of the trigrams in the Primal Arrangement, which corresponds with the world of the idea, Qian is in the south and Kun in the north; Li is in the east as the sun and Kan in the west as the moon. 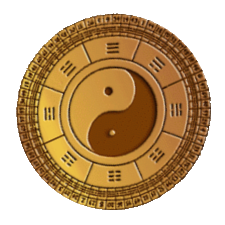 In the Inner-World Arrangement, which corresponds with the phenomenal world, the action is transferred to the four trigrams Zhen (east), Li (south), Dui (west), and Kan (north). Sun and moon here take the place of heaven and earth as active forces. Heaven, Qian, has withdrawn to the northwest, and the eldest son, Zhen, in the east, is the originator of life. The earth, Kun, has withdrawn to the southwest, and the youngest daughter, Dui, in the west, presides over harvest and birth. 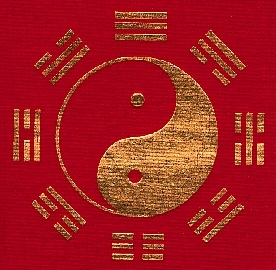 Thus the present hexagram indicates the cosmic order of the relations of the sexes and the cycle of life. The interpretation given by Liu Yuan (1767-1855) in the Zhouyi Hengjie is significant. He sees in the hexagram not the maiden (Dui) following an older man (Zhen), but the elder brother (Zhen) leading his younger sister to her husband. A certain basis for this view is afforded by the words accompanying the fifth line. We are dealing here with reminiscences of matriarchal times disseminated in popular romance by the story of how Zhong Kui gave his sister in marriage. The Marrying Maiden means the beginning and end of humanity, as Zhen in the east means spring, ascent, and Dui in the west means autumn, decline. The commentary then explains the name of the hexagram by citing the attributes of the two trigrams - Dui, joyousness, and Zhen, movement. The judgment on the hexagram, “Undertakings bring misfortune,” is derived from the position of the four middle lines, none of which is in its proper place. “Nothing that would further” results from the position of the six in the third place (one of the rulers of the hexagram), which is over the hard nine in the second place, and from the positions of the other two rulers, the six in the fifth place and the six at the top, both over the hard nine in the fourth place. The image of The Marrying Maiden. Thunder stirs the water of the lake, which follows it in shimmering waves. This symbolizes the girl who follows the man of her choice. But every relationship between individuals bears within it the danger that wrong turns may be taken, leading to endless misunderstandings and disagreements. Therefore it is necessary constantly to remain mindful of the end. If we permit ourselves to drift along, we come together and are parted again as the day may determine. If on the other hand a man fixes his mind on an end that endures, he will succeed in avoiding the reefs that confront the closer relationships of people.